The National Ski Patrol (NSP) doesn’t grow patrollers, it builds them. Each patroller learns his or her skills from a certified NSP instructor. These hardworking instructors are the backbone of all NSP education programs; without them, there would be no patrollers. The skills learned in the NSP Instructor Development Program (ID) focus on principles of adult education that are applicable to any field. The NSP is always seeking talented instructors to deliver its OEC, OET, Avalanche, MTR, Nordic, and Instructor Development. 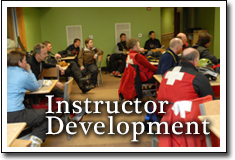 Check the Region web page for course dates, or contact your region Instructor Development Administrator for course information within your region. ​Option 2: Hybrid e-course. 2-3 hours on-line followed by 2-3 hour face-to- face in class session. After taking the online portion, Check the NSP web page or Region website for face-to- face dates, or contact your Region’s Instructor Development Administrator for further information. To become an Instructor in any of the NSP educational disciplines your first step is completing the instructor development course. You should contact the Region Advisor for the respective discipline to indicate your interest and submit an instructor application to that advisor. Mentoring is a vital and significant part of becoming an instructor. You may have a positive, trusting working relationship with an established instructor in your area of interest. Contact that individual about your interest in having them be your mentor after your application has been approved by the Region Advisor. If you are not sure about a mentor, the RA will assign one. For both the mentor and mentees, please see Guide to Mentoring New Instructors on www.nspeast.org under forms.